If you would like to delete a group from within the system you can do so by following these steps. 1. 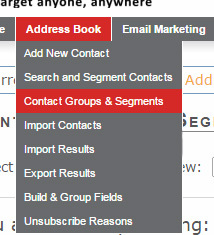 Go to the "Group Listing Screen" by clicking on "Create & Edit Groups" under the Address Book drop down menu. 2. You will then need to locate the group you want deleted and press the red 'delete' icon on the left. 3. If you have contacts in this group a confirmation pop up will appear that looks like this. Press 'OK'. IF you DON'T have contacts in this group the group will be deleted automatically after pressing 'OK'. 4. If you have contacts in the group you are deleting you will be taken to a screen where you can choose to move the contacts to another group. 5. If you are UNSURE of what do to here, just select the bottom option and the default group, like this below.